Imagine getting trapped inside a video game and the only way to get out is to beat it. Yeah, that would be pretty bad news considering all the stats that indicate people don’t generally finish the games they buy. But that conceit made the Sword Art Online light novel and anime series awfully popular, and it’s front and center in the latest mobile game based on that franchise, Sword Art Online: Integral Factor (Free). SAO has had games built around it before, but Bandai Namco has taken an interesting and logical approach with this one. Instead of playing as Kirito, Asuna or other well-known characters, you take on the role of one of the many anonymous players trapped inside the game within the game. Integral Factor then retells the story many fans known from a different point of view, and since it is also an MMORPG in its own right, it’s as close to putting yourself inside Sword Art Online as it’s possible to get. Well, until someone invents the NerveGear, that is. Inside the game, you have access to NPCs and even cross paths with Kirito and the others, but who’s going to be your guide to the game? That would be us. 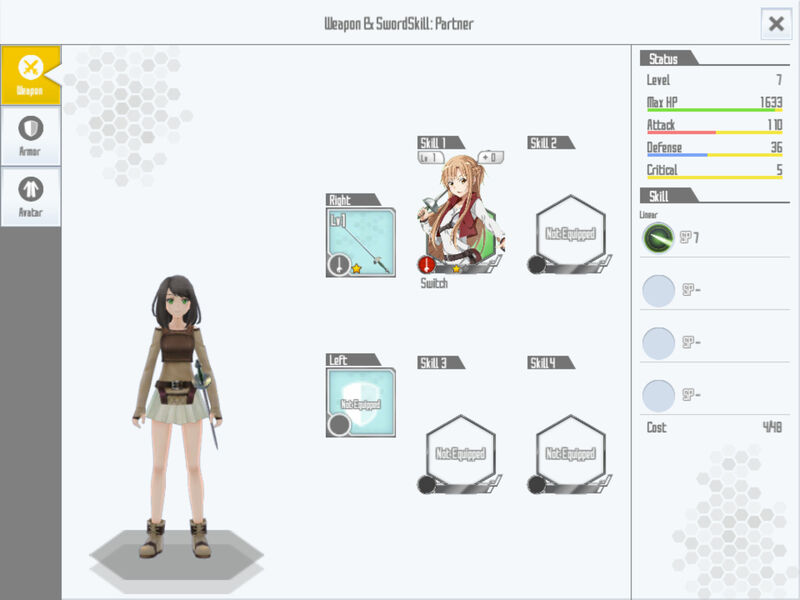 Read on through the rest of our Sword Art Online: Integral Factor tips and you just might make it to floor 100 yourself someday. Integral Factor is played from a third-person perspective and the basic controls are pretty simple. In the bottom-left corner of the screen is a virtual thumbstick to move your character. Anywhere else on the screen, you can hold and drag to look around, as well as pinch to zoom in and out. Buttons in the bottom-right corner of the screen are for combat, which we’ll get to in its own section. The upper-right corner features a mimi-map, which marks both your location and the direction you are currently facing. The next location you need to reach to proceed on your current quest, if any, is marked by a crosshairs, and tapping on the mini-map expands it to a full-sized overlay. 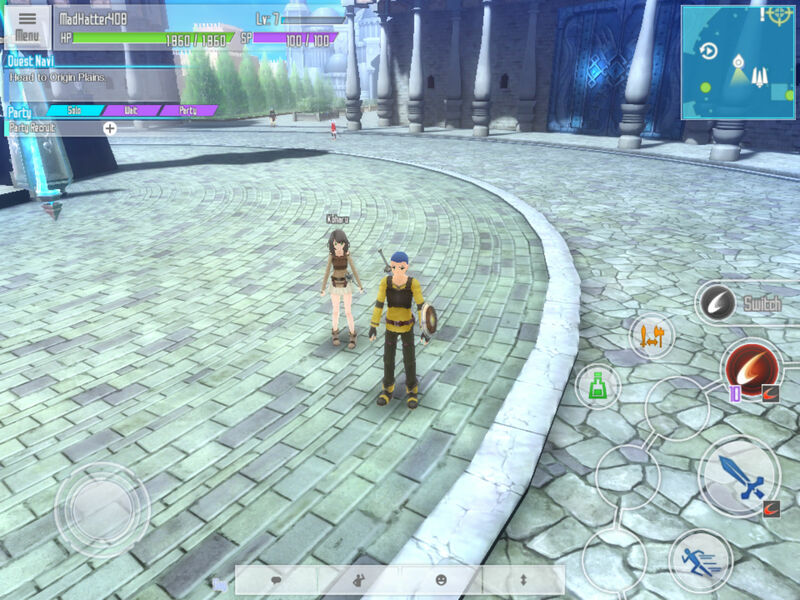 The upper-left corner of the screen has a hamburger icon which will produce a menu (and make your character look as if he or she is accessing the in-game menu in true meta fashion). From there you’ll find tabs to check your character status, equip items, view quest info, find your friends or party members and access the shop. The bar at the bottom of the screen is for in-game communication. Along with emotes and stamps, you’ll also find a chat bar with three option: ‘Say’ is public chat to anyone around, ‘Party’ chats with anyone you are currently grouped with, and ‘Tell’ is like a whisper in other MMOs that sends a message to a particular player. The combat system in Integral Factor is easy to learn but has surprising depth to it. 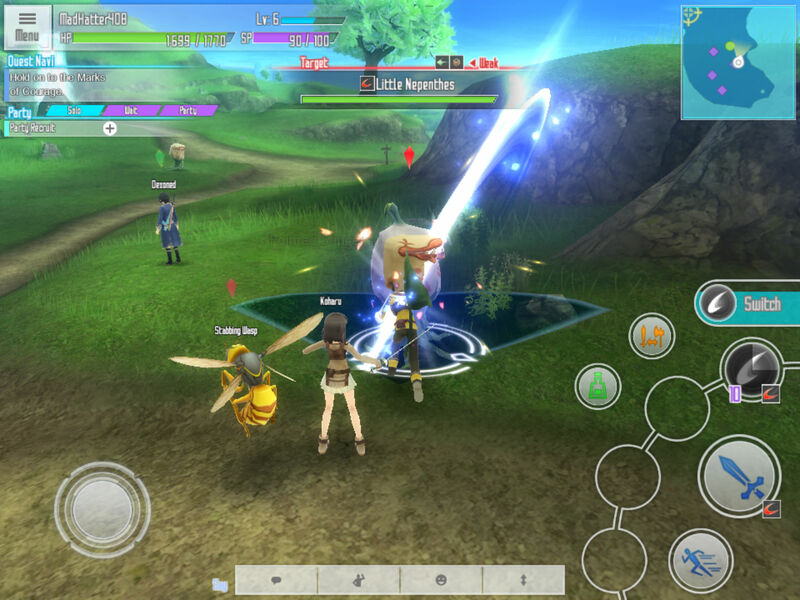 The largest of the buttons in the bottom-right corner is for basic attacks. Simply walk up to an enemy — you’ll know them from the red crystals over their heads — and tap it to start attacking. You can also hold down the button to continuously attack. Four buttons around the main attack button are for sword skills. You start the game with a single skill but can have up to four of them slotted at a time per weapon you have equipped. These skills do more damage than a normal attack, generally effect an area indicated by a darkened area on the screen and can also have other effects on enemies. Just tap the desired skill button to activate it; you’ll have to wait for its cooldown to complete before using it again. Above the skills is a button marked ‘Switch’ that can unleash an especially powerful skill. That button also doubles as a meter that fills up with a light blue color as you damage enemies. When it’s available, the Switch button will flash, and once used, the meter needs to be refilled for its next use. Here’s where things really get fun. The button with the orange weapon icons next to the Switch allows you to swap between two weapons you have equipped. This is useful because some enemies are vulnerable to different types of weapons — for instance, stabbing instead of slashing — but also because swapping on the fly will allow you to use skills from the other weapon while the skills on the previous one are still cooling down. While you won’t need to use this strategy against the enemies you encounter early on, it’s a cool and useful tactic for bosses and stronger foes you fight later on. Last but not least, the button that looks like a faceless Barry Allen in action at the very bottom makes your character dash. However, when engaged in combat, that dash is actually a backstep that can instantly help you avoid incoming attacks. As you progress through the game’s story, you will meet and befriend a character who becomes your partner on all your adventures. Her default name is Koharu, though you can rename her as you like. Along with serving a narrative purpose, your partner aids you in combat, attacking whoever you are targeting and joining in when you use the Switch ability. While you don’t have to worry about controlling or issuing commands to your partner, you do want to remember to equip them with a weapon (or weapon and shield), armor and skills of their own. You can find their stats and equipment by going to ‘Partner’ under the main menu. One last note about partners: When you are in a party with other players, your partners won’t be available since you have other people to watch your back. Where do they go during their downtime? That’s an excellent question. Integral Factor doesn’t make you chase characters to collect, so it needs another gacha-style element. This is a free-to-play game, after all, and Bandai Namco needs to make money from it somehow. In this case, it’s through Orders, which you can find in the ‘Shop’ tab of the menu. Orders allow you to purchase Skill Records that teach and allow you to equip new sword skills. They are based on different characters from the Sword Art Online and come in different rarities. Some Skill Records also are specific to a certain class of weapon, of which there are six: sword, rapier, shield, club, axe and spear. To purchase Orders, you’ll need the game’s premium currency, which is called Arcana Gems. You’ll obtain these in a variety of ways, including as login rewards, for completing achievements and for finishing certain quests. 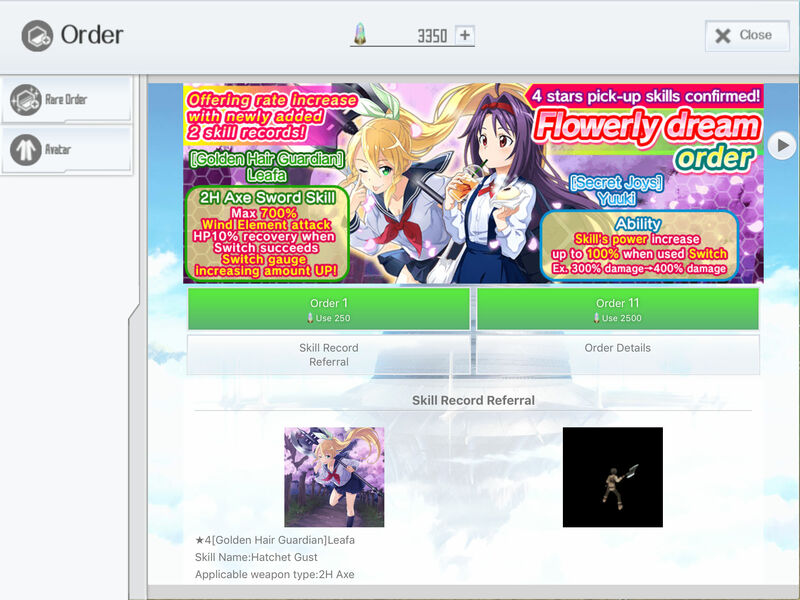 You’ll also receive Skill Records as rewards from time to time too. Not to be confused with sword skills, you can also obtain and equip up to four abilities, the slots for which you will find in your character’s armor tab. Abilities offer passive stat boosts, damage buffs and the like, including bonuses against certain kinds of enemies. Improving your character’s base stats is pretty simple, as things like HP and attack value go up every time you level up. Just keep fighting enemies and completing quests and this simplest form of progression will take care of itself. Everything else you have, including your weapons, sword skills and abilities, can be improved using materials found on your adventures and the common currency of the game, called col. To enhance your equipment or skills/abilities, you’ll want to visit an NPC Blacksmith in any town. Pretty simple menu options will show you what stuff you have that can be enhanced and any materials you have that can be used to that end. 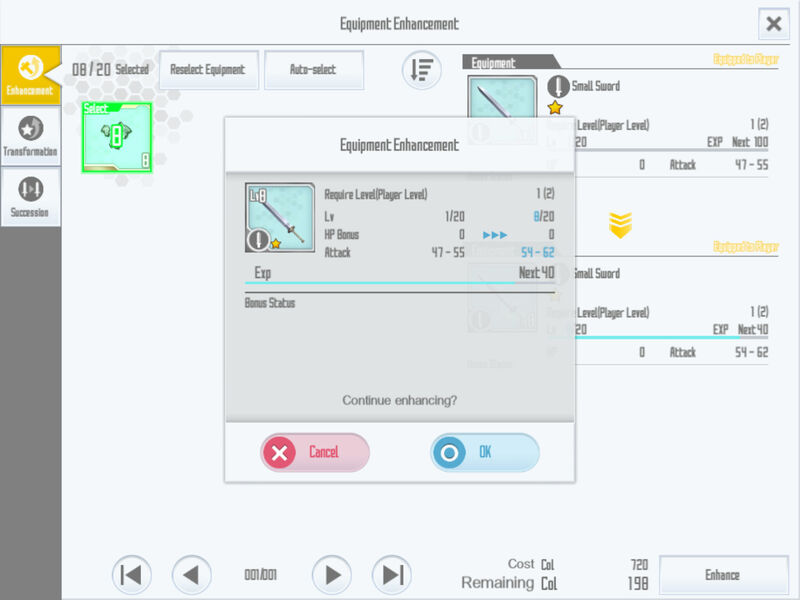 Selecting the materials and item to be enhanced will then show you the exact effect of the enhancement and the cost in col. Then one tap and your stuff is instantly better. If you have an item that is at its max level, you can also perform a process called transforming to bump it up to the next rarity tier, making it even more powerful still — unless it’s maxed out there as well, Skills and abilities will have empty stars if they can be transformed beyond the tier they are currently at. The process is much the same an enhancement but requires different materials and a lot more col. Though we’ll grant you that Kirito preferred solo play when he first stepped into Sword Art Online, it’s not much fun to play alone all the time in an MMO. Integral Factor makes it easy to form parties and tackle quests with other players. From the main menu, simply tap the fourth icon down, which looks like two people, to open the Party menu. 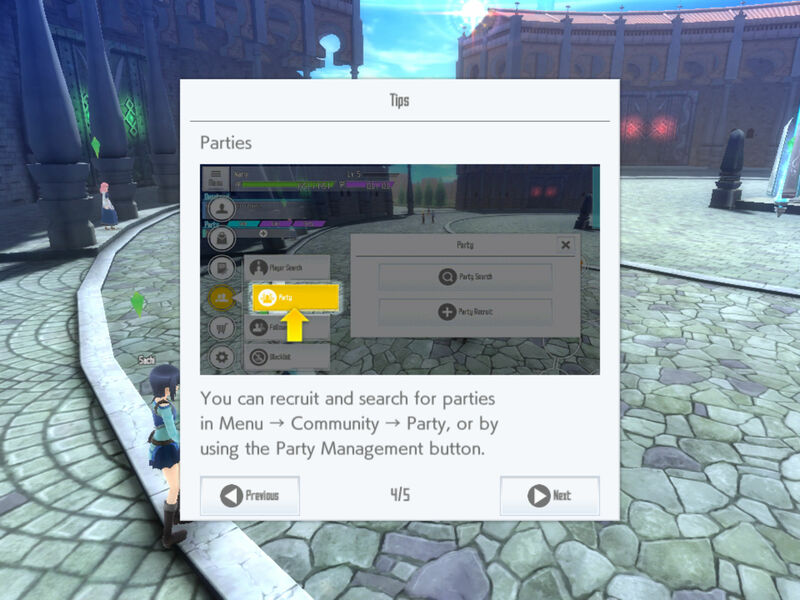 There you’ll be able to use ‘Party Search’ to find parties looking for members, or use ‘Party Recruit’ to start your own party. When doing the latter, you have the ability to set the level range for prospective party members, the size of the party (up to six players) and set a password if desired so that not just any rando can join. Assuming you’ve stayed with us this far, you now have a base of knowledge much better than most of the poor souls in the Sword Art Online series when they first learned they were stuck there. Good luck in reaching the 100th floor and defeating that final boss.